That raspy yapping coming from close to the ground is the signal a pesky little ratdog is in the vicinity. This time, one could look down to see that it was Speaker of the House John Boehner barking out Tea Party talking points with the ferocity of man’s petite best friends. After seeming to acknowledge previously the sort of debacle that would be unleashed should congress fail to raise the nation’s debt limit, and the full catastrophe it would be if America defaults, yesterday Boehner was performing the Teabagger shtick of proclaiming the freedom and ideological joy of going completely mental, in this case refusing to lift the debt ceiling come hell or high water for the nation’s and the world’s economies. Boehner claimed that, “It’s true that allowing America to default would be irresponsible. But it would be more irresponsible to raise the debt ceiling without simultaneously taking dramatic steps to reduce spending and reform the budget process.” Considering that at present the nation’s credit rating is still superior, its bonds are the world’s most attractive, and credit is widely available at low interest rates in the United States, one does wonder what sort of incisive analysis comes up with the declaration that it would be preferable to plunge the nation into default, diminish the nation’s credit, reduce the lure of its bonds and drive the cost of capital in the United States through the proverbial roof rather than simply to vote, as been done countless times before, to raise the nation’s somewhat arbitrary debt ceiling. Boehner’s coming close to nailing his own hide to an inflexible and suicidal negotiating position, faced with specifying where “trillions” of dollars will come from or being responsible for forcing the nation into default. To get “trillions” would require gutting Medicare, so he can only vaguely talk of trillions for so long before enflaming the wrath of some eighty-plus percent of the electorate strongly opposed to changes in Medicare by identifying the actual cuts. 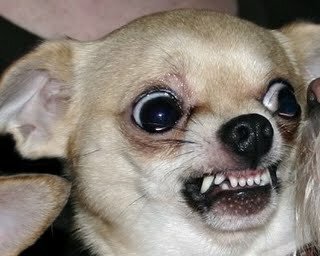 So this may be Boehner’s best imitation of the little Chihuahua snarling like he’s a wolverine. In an acrobatic display of Orwellian doublespeak, Boehner said the country needs to have an “honest conversation” about the debt while dishonestly ruling out raising revenue through tax increases for the wealthy, and leaving out making defense cuts or addressing insurer and hospital culpability in the rise of health care costs, the principal factor in higher Medicare payments. Perhaps when he uttered the phrase “honest conversation” he intended a vocal inflection that suddenly failed him, meaning it to be taken as sarcasm, given that the three principal causes for the deficit: tax cuts for the wealthy, health costs and wars are off the table in this oh so honest conversation. While most of the Teabagger set hasn’t been elected to anything, and could experience the sort of psychiatric ward jubilation that breaks out at the sight of something tragically bizarre, Republicans who have to stand for election again, which means every Republican in the House of Representatives each election cycle, are not going to have nearly as good a time. Still, I consider it undeniably valuable to witness Boehner’s leadership by example on the matter of honesty in conversation.